Jabra, a world leader in the development, manufacturing, and marketing of a broad range of hands-free communications solutions has announced the availability of their portable Solemate speaker. The small and lightweight speaker features a thick carrying strap that makes it easier to carry around and use in any environment. A unique rubber ‘sole’ stores a 3.5 mm audio cable and a sound bag provides an extra layer of protection in sand, moisture and sunny outdoor conditions. 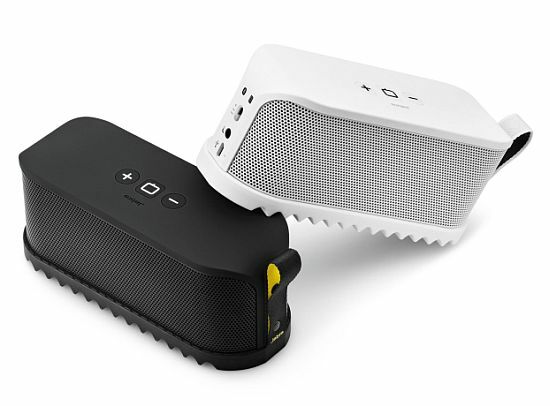 A multifunctional portable wireless speaker, the Jabra Solemate enables music lovers to enjoy the freedom of big sound with strong, deep bass from an integrated subwoofer and rich, vibrant acoustics from dual tweeters. The Jabra Solemate connects to any device that can play music – either corded or wirelessly – using Bluetooth technology, a 3.5mm audio cable or USB cable, and caters to all types of uses, indoors or outdoors. Whether connected to a mobile phone, tablet, iPad, iPod, mp3 Player or laptop, the Solemate is the perfect audio companion to play music clearly and loudly. PLAY ON! – Play music while lying at the beach, hanging out in a park, hosting a barbeque, or relaxing at home. Or, amplify the volume while streaming YouTube videos or watching movies. MIX ON! – Simply and instantly create your own songs with ClubCreate and take them with you via the Solemate. DANCE ON! – Dance to unbelievable sound quality at the next social event, birthday party, or holiday extravaganza. GAME ON! – Turn-up the volume on mobile videogames and beat the top score. TALK ON! – Catch up with friends, family and colleagues via phone or video chat services like Skype and on a mobile phone, PC, or tablet. CARRY ON! – Solemate is meant to travel. Small, light and comes with its own sound bag! PARTY ON! – Sweat, dust, splash and shock resistant. Jabra has also announced a partnership with ClubCreate, a social platform for music creation and collaboration that allows music lovers to play their remixed tunes via the Solemate speaker. With the rise of creating customized music and ring tones for mobile phones, the Jabra Solemate and ClubCreate partnership capitalizes on the trend, enabling users to legally create and personalize their own music with ClubCreate and share what they’ve created with friends and family via the Solemate. The Jabra Solemate ($199) comes in black or white and will be available at Best Buy retail stores and online at BestBuy.com, Amazon.com, Jabra.com, and ClubCreate.com.